Destiny begins each chapter with an art lesson followed by her autobiographical narrative bringing us along as she discovers her passion for art, uncovers her abilities, and sculpts a new life. Shaping Destiny has been compared to Zen and the Art of Motorcycle Maintenance and Destiny’s writing has been compared to that of Anne Lamott and Annie Dillard. If you are a creative or artistic person, if you enjoy memoirs, or if you are at a crossroads and need a bit of encouragement I highly recommend Shaping Destiny: A Quest for Meaning in Art and Life. Shaping Destiny: A Quest for Meaning in Art and Life is available in print and for Kindle at Amazon. Free Download Days! Download your copy of Shaping Destiny for Free today August 6 and on the following Saturdays: August 11, 18, & 25. Enter to win a print copy in the Rafflecopter form at the bottom of this post. Enjoy the book trailer of Destiny talking about her book below! Destiny Allison is an artist, a business woman and an author. 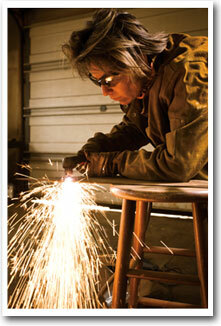 Her work is collected by public institutions and private individuals internationally. 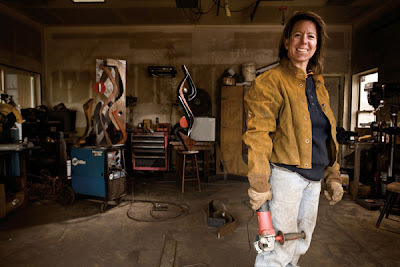 In addition to her numerous awards for excellence in art, she was also recently named Santa Fe Business Woman of the year for 2011. She works as an artist full time. She is also a managing partner in La Tienda at Eldorado—a commercial complex, community center, and arts center in Santa Fe, NM. She is represented in prominent galleries across the country and owns her own gallery, Destiny Allison Fine Art, located at La Tienda. Allison’s first love was writing. Her first poems were published while she was a child and she received numerous awards during adolescence. The story of how she became a visual artist is told in her book, Shaping Destiny: A quest for meaning in art and life. While her focus over the last 20 years has been primarily on sculpture, Allison also paints on steel using acids and natural oxidation, and in acrylics. Allison currently resides in Santa Fe, NM. WOW: Your love of language goes back to your childhood; can you share a little on that? Destiny: I have always been an avid reader. I think I learned to read when I was three and have been literally devouring books ever since. When I was eight, I started writing poetry. I’m not sure what inspired me to do this but it brought me very close with my father. We spent countless hours together going over my poems and when I watched what happened when we replaced one word with another, or rearranged a line, I was enthralled. Later, in high school, I was fortunate to have Latin as a required class. I loved it. The origins of words, their roots and intended meanings opened up a whole new world for me. When I began to study Greek mythology, that awareness deepened and I was forever hooked. The stories of Narcissus, Pan, Eros, inspired my imagination. Language, or rather the written word, was my first love. WOW: Tell us about your pre-sculpture writing life. Destiny: I was first published at nine. The local newspaper ran a youth section and regularly paid young authors for their poems, short stories and essays. I was one of their frequent contributors. After that first taste, I planned to be a writer. Through high school and into college, I pursued writing with a vengeance. Then, in my early twenties, I re-read a couple of my favorite books and realized I didn’t have an original thought in my head. I was just recycling what I had gleaned from them. I gave up any aspirations to write for a living and after that, I only wrote for myself. WOW: When it came to discovering, or uncovering, yourself, what did sculpture give you that words could not? Destiny: Sculpture is so demanding physically that it is almost impossible for me to get lost in the wanderings of my mind or my emotions alone. It requires an intense focus not unlike the focus you develop when you are engaged in competitive sports. Somehow, the combination of physical and mental exertion is merged and it’s like I am in the “zone.” I am not thinking. I am just being. Mind, body, and spirit are working in unison and I am fully present in my creativity. What that really means is that I can’t talk myself into or out of anything when I’m working on a sculpture. It will demand its own from me and it has taught me how to be fully present in whatever media I happen to be using. WOW: What prompted you to write Shaping Destiny? Destiny: Something called me to do it. I’m not sure if I can say with any certainty what that was. I think there were lots of things at play. I knew I was ready to look back and let go of some of the grief I was still carrying. I also wanted to understand how I got to where I did and really look at the impact of art on my life. There was also a very real desire to share what I had learned with others who find themselves trapped in lives that make them miserable. I wanted, through the book, to inspire them to break out, walk away, do what they have to do to be themselves and make a life of their choosing. WOW: In your preface you state that several of the stories you shared later proved to be incorrect, yet it was those memories that shaped you. “Getting the story straight” can block a would-be memoirist; what advice would you offer her? Destiny: I wrote that in deference to my mother and other people in the book who remembered some things differently than I did. I think what is true is always a matter of perspective. For example, let’s say I am sitting on one side of a table and another person is sitting across from me. In the center of the table there is a large vase of flowers. From where I sit, I see three daisies, two roses, a sprig of green, and a purple iris. My companion, looking at the same vase, sees two daisies, three roses, and a sprig of green. We both agree we are looking at the same vase of flowers. Later, when we describe that bouquet to a friend, I might speak of the purple iris. My companion will not recall an iris. She might even swear that there were no irises in the vase and imply that my memory was faulty. The truth is we are both right. Our memories of the same thing are distinctly different. One memory is no more valid than another. For me, the purple iris may have stuck in my mind because it reminded me of the wild irises growing in the canyon where I grew up. As a memoirist, it is not my job to be a historian. It is my job to sort out what the memory means to me, how it informed my knowledge, and what part it played in my story. Shaping Destiny has a wide appeal—beyond those who might be considered “artists.” What are your thoughts on that? Destiny: I am thrilled by this. I had imagined that the book would primarily appeal to women artists. As it turns out, men and women, artists and non-artists love it. I think this might be because we all wrestle with the conflict between who we are supposed to be and who we actually are. The letters and comments I get are filled with appreciation for the inspirational aspects of the book. I think people who read the book realized that they can change their lives. They can be honest with themselves and those they love and that fundamentally they are also creative, passionate, amazing people whether they are artists or not. WOW: I fell in love with the book by the end of the first chapter; Shaping Destiny is up on my “top five” list! The way you tell your story encourages readers to take an objective look at themselves and their lives. So often people are afraid to move forward—whether it is out of an unfulfilling relationship or into a new career or self-expression. What would you like to say to them? Destiny: Do one thing that makes you happy. Just one. Then see where it goes. We all get stuck and afraid from time to time and we think that we need to make a huge shift in our lives in order to be happy. I have found that baby steps usually take me where I need to go. Just recently, I made a small change that has made a huge difference. Over the last year, I have been increasingly unhappy and have been feeling really guilty about it because I have nothing to be unhappy about. I love my husband. I have great kids. My sculptures and book are selling well. Things are great. So why do I feel like crying or raging so often? In an off the cuff comment to my husband, I realized that I am miserable because my life is really noisy. Kids, dogs, telephones, video games, Television, on top of the noises of work—grinders, compressors, and business meetings—fill pretty much every waking minute. I need quiet. I need alone time. One afternoon, without telling anyone, I took over a guest bedroom, decorated it with things I love, and made a space just for me. I told my family they were not to enter without permission. I promised myself I would meditate every morning for at least fifteen minutes, and I would write a minimum of 500 words a day. Basically, I gave myself permission to take an hour every morning to myself. I reminded myself that I am as important as everyone else in my life. The effect has been profound. I am bubbling. I am writing fiction, of all things, and having a blast. My family is cheering me on because, frankly, I’m a lot more fun to be around when I’m not so cranky. They couldn’t give me what I needed until I was willing to take what I needed. Maybe you can’t take an hour a day. Maybe you can only take an hour a week. It doesn’t matter. Take what you can and do one thing you want to do. But just do it. Don’t take a class. Don’t even share what you are doing. Don’t let anyone watch you, or try to help you. Let it be your secret, your treasure, your sacred space. Then, journal about what you experience when you take that time. Write about all the thrills, fears, joys and frustrations. Give your journal 5 minutes before you start doing whatever it is you decide to do. You don’t have to make major changes all of a sudden (unless you are in an abusive relationship. Then you have to run). As you find your joy, your life will evolve and the changes you seek happen naturally. WOW: You have a wonderful community on your blog, plus you support other artists at La Tienda; tell us a little about how you give back to other artists. Destiny: As a culture, we put so much emphasis on the art object that we actually kill the creative process in many instances. Artists and writers work so hard on the things they think will sell that they stop being artists and become manufacturers. This is not good for the world. Artists need places where they can be passionate about the work that matters to them. They need to be part of communities that accept, embrace, and support their creativity. Communities need artists to express our commonality, local aesthetics, and community values. 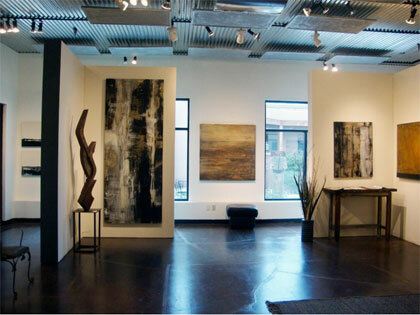 Consequently, my husband and I sponsor a large professional gallery space that we let local artists use for free. The artists keep 100% of their sales. We also sponsor monthly independent film screenings, author readings, art talks, live music, and anything we can think of to promote the arts and ensure that art is an intrinsic part of community life. The effects of this have been amazing. The community has transformed itself and the businesses are healthy, in spite of the current economic climate. Having art be part of every day life has inspired even non-artists to pursue their passions. We now have garden tours, cycling groups, and lots of other community activities that all stemmed from making artists, as well as their art, important. Destiny: I think the best answer to that question is, “What time is it?” I think I am always working on something. This fall, I hope to start a new nonfiction work that focuses on how art transforms communities and I am doing research and collecting data for it now. I am also working on a novel and am ridiculously excited about it. In addition, I continue to sculpt and am in my studio for several hours almost every day. When I am not writing or sculpting, I am at La Tienda where, as a managing partner, I am running the exhibit space, performance space, and doing the marketing for the center as a whole. WOW: Sounds like a beautiful, passionate . . . and very busy life! Destiny Allison shares her perspective on the relationship between art and life. Gain an artist’s perspective! Artist and Craft Book Editor, Michelle Mach, hosts an art-centered interview with Destiny Allison today and also gives us her review of Shaping Destiny. Confused by publishing options? Destiny shares why she chose to self-publish her book Shaping Destiny. The husband, the kids, the bills…and work! How do you do it all? Join us as Destiny talks about the unique challenge of being a woman artist. You might win a print copy of Shaping Destiny! Because life is too short not to! Destiny guest posts today about living your passion! Learn more about Destiny Allison and her experience with her autobiography, Shaping Destiny. Join indie-crafts editor Rosie Bromberg for a review of Shaping Destiny! Join us for one of Linda’s fun, and sometimes revealing, interviews! Today’s guest is Destiny Allison, author of Shaping Destiny: A Quest for Meaning in Art and Life. Enjoy a book review and enter to win a signed copy of Destiny’s book! To view all our touring authors, check out our Events Calendar here. You can also follow our tours by adding @WOWBlogTour to your Twitter account! Enter to win! 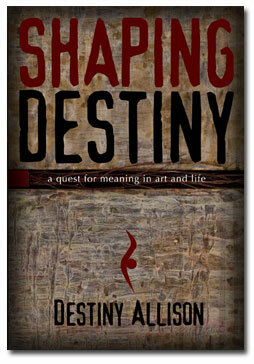 The winner will receive a signed copy of Shaping Destiny: A Quest for Meaning in Art and Life! Fill out the Rafflecopter form below. Winner will be announced on Friday, August 10th. One, I loved getting a glimpse at some great sculptures (the one that had a close-up photo of it was striking) and two, it was fascinating getting into the head of Destiny as an artist. Finding out she needed "quiet time"--and then carving it out--was necessary. Artists need to be attuned to what they require, and have to be "selfish" when demanding it. I would love to win a copy of this book. I'll keep my fingers crossed (and also my eyes--ha). Hi Sioux and Margo. Thanks for the comments! Sioux, I hope you win the copy. Margo, it was my mom that suggested the Shaping Destiny part of the title. I'm looking forward to being a guest on your blog. Thanks for hosting me. I think my favorite thing that has happened since the book was released was the growing of a new community of fabulous, intelligent, creative women. Thanks to both of you for being a part of it. Congratulations, Ms. Allison! We're always proud and happy to see the creative side of Santa Fe represented so well. Your book sounds very soulful. We'll have to pick up a copy! Thanks so much Santa Fe! Proud to be a part of this incredible city. Destiny, I am thrilled to read this book! Thanks Lissa. I look forward to hearing your thoughts on it as you progress. You can connect with me on facebook at facebook.com/shapingdestiny. I love art, and I am right there in the struggle to find myself and what makes me truly happy. Sounds like a must read for me! I hope you enjoy it Muddy and that you are successful in finding yourself and your passion. At the end of it, I think our lives are our greatest works of art and finding ourelves and our passion is like imagining our days like blank canvases. What will we make today? Sounds like a great book!! Would love to read it! !